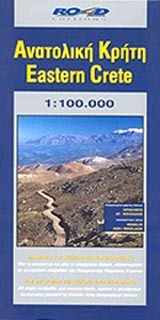 Printed in a scale of 1:100.000 that is the most in detail scale that exists for a map of Crete, one can find the richest road network that has been presented never in a map of Crete, the most precise geophysical background (in collaboration with the Geographic Service of Army) with all the rivers the island, and the largest information that interests the sightseer: all the archaeological spaces, monasteries, country chapels, castles. The admirers of nature and the walkers will be will be charmed by the layout of the E4 path and its connections, the mountaineering shelters, the mountain tops, the gorges, the ravines. Are included also two analytic and updated maps of the cities of Heraklion and Saint Nikolaos, with all the pedestrian areas, direction of circulation in all the streets and a lot of other information.